The Blackhawk Museum is known for their extensive automotive gallery, but many are unaware that the institution’s collected works have grown to include a variety of culturally specific galleries over the years. The Spirit of the Old West highlights American history on the Western frontier, the Art of Africa exhibit features various artifacts from indigenous peoples of sub-Saharan Africa, and the newest of the three, the Into China gallery, brilliantly showcases the intricately handcrafted masterpieces that exemplify traditional Chinese customs and culture. We decided to pay Blackhawk Museum a visit to learn more about its newest exhibit, and after strolling past its vaulted glass ceilings and ornately decorated hallways, we were well on our way Into China. Entering the gallery, it’s difficult deciding which display is meant to be the star attraction. Visitors begin their journey by walking through the gallery’s ‘moon gate’, a Chinese door that symbolizes the passing from one world to another. Guests are greeted by The Great Dragon, a singular piece of wood carved from the root of a tree and transformed into a work of art. Well worth the wait, this mythical masterpiece took the two famous wood carvers, Donga Lu and Wei Zhang, over a year and a half to curate materials in addition to “100 days and 100 nights” of carving to complete the piece. A sprawling handcrafted sculpture, appropriately named “Dreamland,” leads guests deeper into the exhibit’s embrace. Unlike the Great Dragon, Dreamland is carved entirely from Tuchen wood, a type of fossil wood that spends a thousand years underground before it’s unearthed to be worked on by artists. Those that are familiar with the material have called it “the wood that smells good.” After 11 years of sourcing this rare commodity from Burma and Laos, and seven years of carving, the 80-foot display denotes an idyllic fantasy land where its elaborately carved residents are perpetually free to seek a happy and peaceful life. Past a row of authentic Chinese garb and situated next to a collection of ornamental ceramics from both Ming and Qing dynasties, sits a massive golden throne. 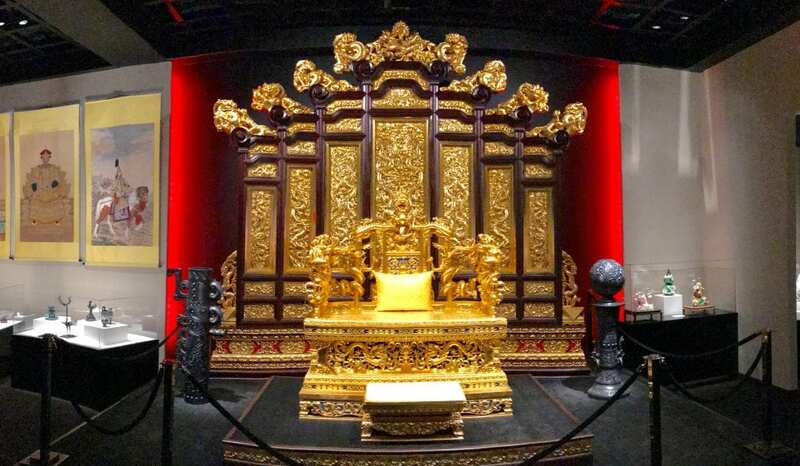 Some might recognize it as an exact replica of the Dragon Throne currently sitting in the Forbidden City, others might recall it’s appearance in the movie The Last Emperor. The historic replica’s elaborate dragon carvings cased in gold shine brightly at the center of the exhibit’s back wall, simultaneously absorbing and bending most of the light in the room. Its vibrance and size is breathtaking, and its grandiosity summons guests to imagine a time when those that sat on this throne were synonymous with divinity. 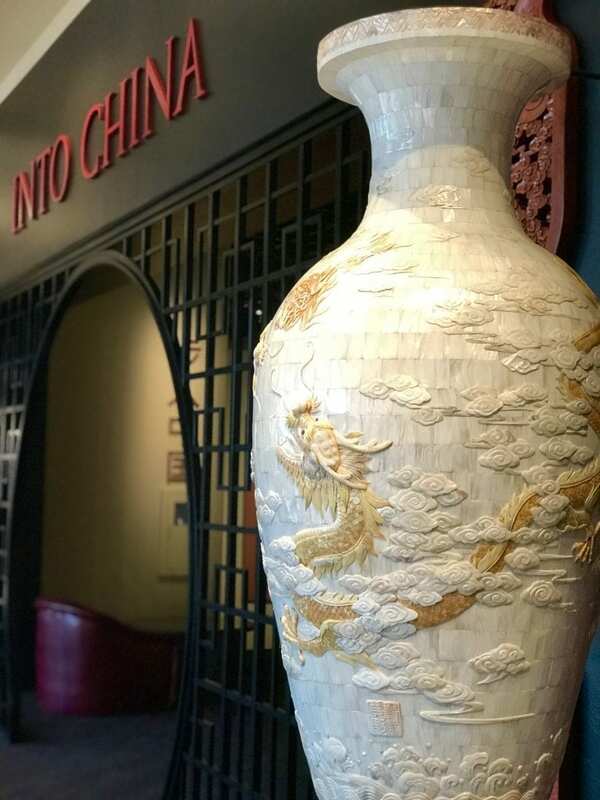 Other features of the Into China exhibit include a historical background of popular Eastern religions and philosophies like Buddhism and Confucianism, complete with authentic relics. Beautifully adorning the gallery walls are visual accounts of the historically renowned Forbidden City and a brief history regarding the building of the Great Wall. Individually, each presentation is awe-inspiring, but as a unified compilation, the central values of Chinese culture are brought into the light. This vast exhibition is still growing, with museum directors aiming for its completion in Summer of 2018. 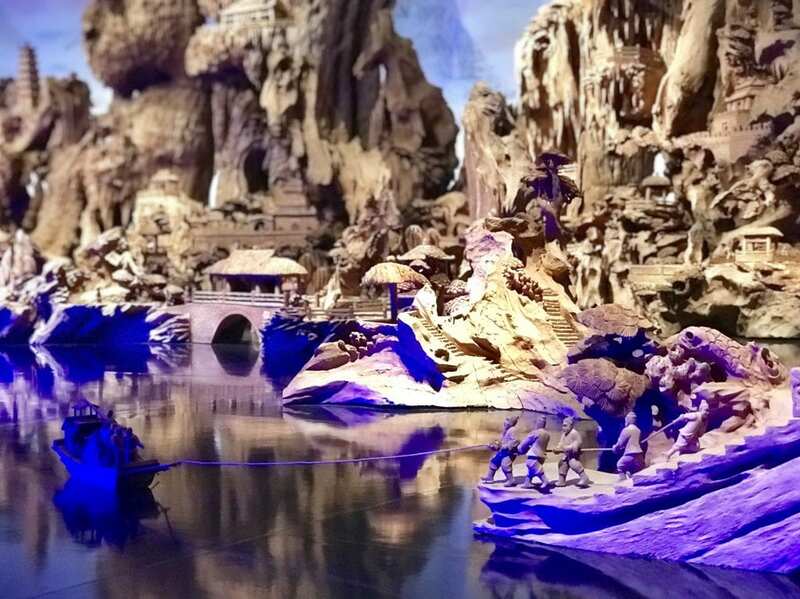 Future installations will include Terracotta Warrior replications, a 25-foot miniature model of the Forbidden City, a timeline detailing the evolution of fine China, and various hand-made relics. 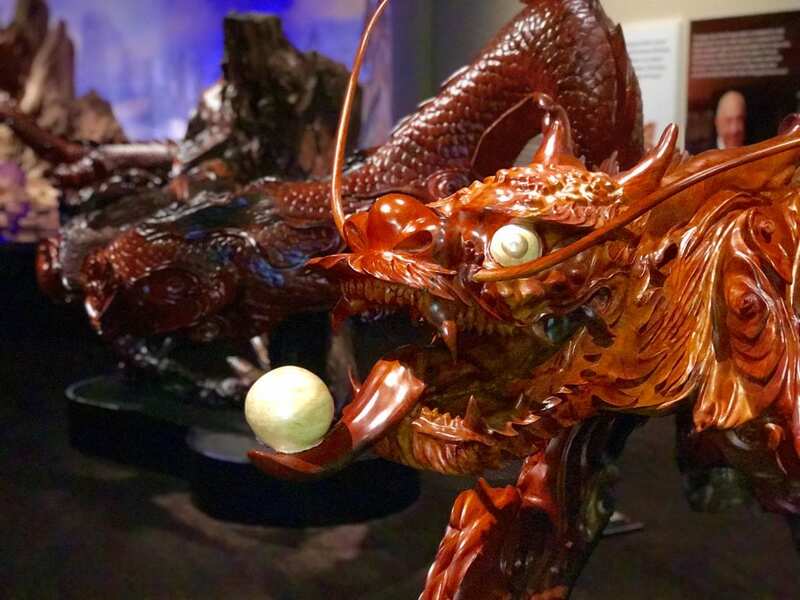 In the meantime, the Blackhawk Museum’s collection of genuine, hand-made artifacts brings to life a beautiful tale of traditional Chinese culture, values, and beliefs. Check out our video visit below!